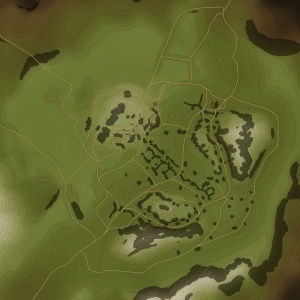 Carpathians is a ground forces map available in all modes, it was added in Update 1.41.27.12 (a major patch between Update 1.41 and 1.43). The map is set in the Carpathian Mountain range, in Eastern Europe. The center of the map is an open field, with some natural depressions, and a trench system in the middle, to provide cover. There are a few rocky hills in the north-east, and south of the map and a main, larger hill in the west. There is a ruined castle on top the western hill providing a location for close quarters flights, and a good position to shoot down on players in the middle and east of the map. The tank battles map is 2km x 2km and the air battles map is 65km x 65km. Two armies ran into a fight for possession of the mountain pass. The Carpathians is a mountain range stretching throughout Central Europe into Eastern and Southeastern Europe. Today the Carpathians is divided into three sections, Western (Czechoslovakia, Poland, Slovakia), Eastern (southeastern poland, eastern Slovakia, Ukraine, Romania), and Southern (Romania, Serbia). As a range passing through most of the Eastern Front, the Germans attempt to defend the Carpathian region via the passes while the Soviets attempt to break through the mountain ranges. This culminated to the Battle of Dukla Pass that lasted from September to October 1944. The battle ended indecisively with both sides suffering losses, but the Axis' dwindling manpower causes them to withdraw and the Soviets were able to continue and liberate Ukraine. There are three Capture Points. Point A will be in the middle of map in a formation of rocks, B is on the bottom right side, C is on the fortress structure on the hill top left of the map. There are three configurations of the conquest mode, each with one capture point. The point will either be at the north valley, middle hill, or south cliff. There are two capture points, each belonging to a team. The points are located north and south of the trench system in the middle of the map. One flag will be on the castle on northwest hill that, when taken, will unlock a flag close to the original spawn point for the opposing team. 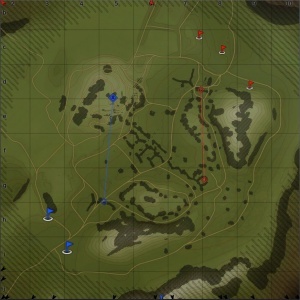 The other flag will be in the fortified pit in the south east that, when taken, will unlock a point close to the original spawn point for the opposing team. This page was last edited on 7 March 2019, at 16:49.